This quiet cul-de-sac home's colorful garden pathway leads you onto a covered front courtyard. 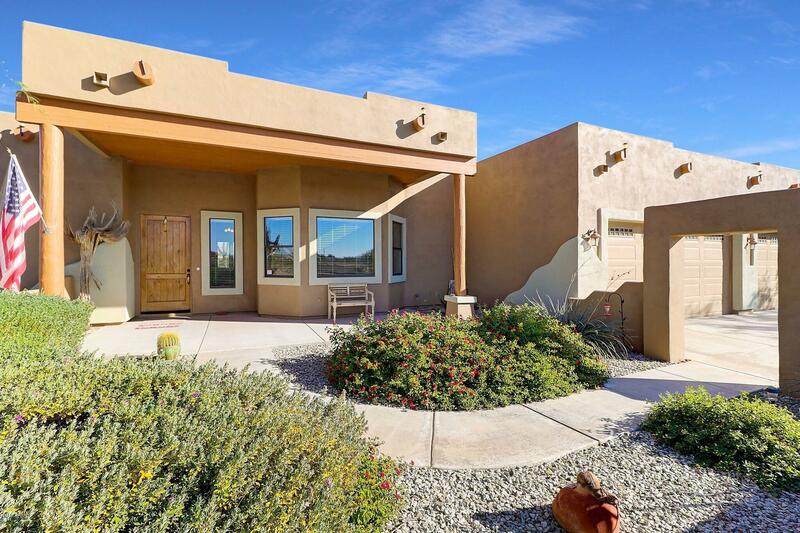 Freshly painted Southwest styled custom home boasts large open spaces, 12-foot ceilings, stained concrete floor with architectural scoring, log pillars and numerous niches. The split floor plan provides the vast master bedroom with privacy making it a true retreat. Dual vanities, walk-in closet, an oversized jetted tub, and multiple shower heads, will invoke the feeling of a spa vacation. 3 generously sized secondary bedrooms leave the whole family feeling comfortable with plenty of room for everyone. Big, bright bay window sheds light on the gorgeous kitchen with tons of soft-close cabinetry, stainless steel appliances, and enormous pantry.